Similar Species: The Mountain Chickadee Poecile gambeli is distinguished from the Black-capped Chickadee by a white line over the eye. In Canada, it lives only in the mountains of British Columbia and Alberta. The two species hybridize, or interbreed, occasionally. The Boreal Chickadee Poecile hudsonicus has a brown cap, greyish-brown above and dusky white or light grey below with rust-coloured sides. Its cheek patches are often dusky white and the throat patch is black. Like the Black-capped Chickadee, it lives right across Canada, but resides in the belt of coniferous forest that extends to the northern treeline. Boreal and Black-capped Chickadees overlap at the edges of their breeding ranges, but do not hybridize. The Black-capped Chickadee is found throughout Canada, from the island of Newfoundland to British Columbia (except for the coastal islands) and extends northwards into the southern Yukon and Northwest Territories. 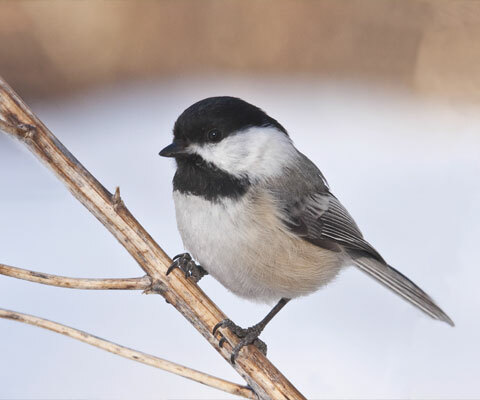 Habitat: It lives in tree-covered areas — including woodlots and orchards — where it digs its nest-holes in the soft or rotting wood of The Black-capped Chickadee lives in forests, orchards and other areas with lots of trees, including many urban areas. trees and finds the food it prefers. Diet: The Black-capped Chickadee eats a mixture of seeds, insects and spiders. About 80 to 90 percent of its diet consists of invertebrates during the breeding season, and about 50 percent during the winter. They will eat insects, such as weevils, lice, sawflies in their various stages from egg to adulthood. When food is abundant, the chickadee hides pieces of food all over its territory for times of decreased food availability. From fall to winter, Black-capped Chickadees live in flocks of up to 12 individuals. This allows them to work as a team to guard a home territory of up to 20 hectares. Each flock is made up of pairs who mate successfully in the area the season before, and juveniles from surrounding areas who are in search of a mate. This immigration of new birds to a population ensures there is no inbreeding. The flock will remain together from October to March and will immediately establish a “pecking order,” or hierarchy. Establishing the highest possible rank in the flock is important, as the more dominant individuals enjoy first access to roosting spots, food and mates. The birds will generally pair according to rank, with the more aggressive females pairing with the more aggressive males. Once territory and pecking order are established, the flock collectively defend their territory. In northern habitats, chickadees roost in dense evergreen trees that provide shelter from the cold winter wind and snow. Any small holes will also be used as shelter, and roosting spots are often used repeatedly over the winter. They also survive the cold with the ability to lower their body temperatures to conserve energy. They also keep warm by lifting their feathers, trapping warm air close to their bodies. February and March are courtship months followed by the task of choosing a nesting site that is then defended by the male. To make the nest, the pair dig out a hole (cavity) in the rotting wood of a dead stump, usually about 1 to 3 m above ground or 9 to 12 m up in the dead parts of live trees. They are also known to use abandoned holes made by cavity-nesting birds such as woodpeckers. The female lays one egg a day until there are five to 10 eggs which are white with fine dark spots. After 13 or 14 days, the young hatch. The female broods, or warms, the young until they are well feathered. Both parents clean the nest by carrying away the droppings, and feed the nestlings six to 14 times an hour. After 16 - 17 days, the young are ready to leave the nest. The parents continue to feed them for an additional two to three weeks, while they gradually learn to feed themselves. The Black-capped Chickadee’s main predators include bird-hunting hawks and the Northern Shrike. In addition, snakes, weasels, mice, chipmunks and squirrels will often steal eggs during breeding season. Because their diet consists primarily of insects, these birds are important for pest control. To ensure chickadees have sufficient habitat and a safe food supply, consider leaving dead or dying trees standing, where it is safe to do so. If necessary, trim potentially dangerous branches and allow the trunk to stand a few years more. This will provide a source of food and shelter for these and other birds that require cavities for roosting (sleeping) and nesting. It will also provide a source of food with spiders and insects living along the trunk and branches. Allow native plants to flourish, either in formal garden beds or by leaving part of your garden a little wild and use natural methods of pest and weed control. These are all critically important for the health of our ecosystem and the wildlife that depends on it. You might also wish to supplement their food source with sunflower seeds in a bird feeder. This is especially important in attracting chickadees during winter months. Another way to help is by keeping domestic cats inside, on a leash or in an enclosure designed so cats can go outside within a restricted area. Cats have become a problem for wildlife because they hunt many species of birds. Notes: The Black-capped Chickadee sings its name and is a curious bird that will often come to see who has entered their territory. They are a species of bird that will often feed from a person’s hand.